That's just a misspelling of coffee, right? If I had to pick a candy, toffee wouldn't be it. Hard candies are just... bleh. To me. I forget how I came across this recipe for layered toffee bars. Pinterest, most likely. Crackers... sugar... butter... chocolate? There are more ingredients, of course, but I'm hitting the highlights. And I had all the ingredients, even the crackers, go figure. 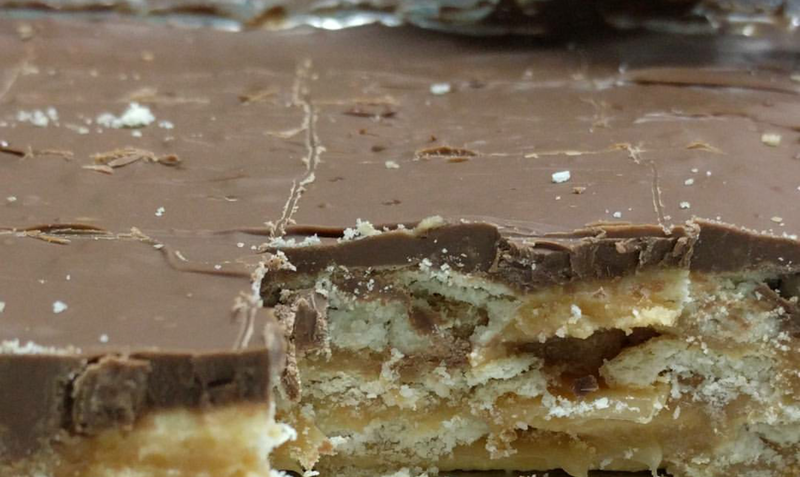 Making this was surprisingly easy, but be careful when making the toffee part. Because. Molten hot liquid that hurts like a mother when you accidentally splash it on your skin. And drop the pot. Needless to say I had to redo the toffee part. I tried a little bit. It was okay, but still not my thing. My co-workers loved it, and it disappeared quickly.